Department of Plastic Surgery, Georgetown University Hospital, Washington DC, USA. Copyright © 2013 Steven P. Davison et al. This is an open access article distributed under the Creative Commons Attribution License, which permits unrestricted use, distribution, and reproduction in any medium, provided the original work is properly cited. From our perspective, there is a renaissance in microsurgery. The emphasis on the potential use of microsurgery, if not the volume, has unquestionably increased. It is reflected at meetings and mirrored in our own training program where five of the last nine graduates have elected to do micro fellowships. These are graduates from a program in which residents perform around one hundred micro cases each by the time they graduate. The pendulum’s swing back to microsurgery can be attributed to the interest in perforator flaps, with the DIEP at the forefront [1,2]. Microsurgery has had phases of evolution that we have witnessed. The late 1970’s and early 1980’s were an age of anatomy. Examples of this are Taylor, McGregor, and Jackson’s work on the DCIA flap and Bill Swartz’s development of the scapular flap [3-5]. The 80’s was an age of application as free flaps became more accepted and usefulness increased [6,7]. We would characterize the 1990’s as the age of anastomosis. In this time of Centers of Excellence, MD Anderson, Sloan Kettering, and the Bunke Clinic established benchmarks of success in the anastomosis patency [8-12]. However, similar to theories about Nature vs. Nurture in raising children; is success at their centers a result of their technique versus their environment? In the new millennium, we have resurrected the anatomy phase with the development of perforator flaps. The development of the DIEP followed by SGAP and subsequent perforator flaps has created a new phase of microsurgery [2,13-17]. The next phase would seem to be poised for that of allotransplantation . However, a legacy of the anastomotic era is that all failures are attributed to surgical technique [15,19]. The new anatomical era is unwilling to sacrifice anatomical preservation for anastomotic failure. Success rates have stabilized. A base line acceptable rate of success is 95% - 96% . Some surgeons doing highly consistent operations have achieved considerably higher rates, 99.61% . Some flaps, like the DCIA with bone, have historically higher failure rates, which we have found to be true . Unfortunately, in patients with head and neck reconstructive needs and peripheral vascular disease, it may preclude other suitable donor sites such as a fibula. We propose that although technical errors obviously contribute to flap failure, it is just not that simple. Most things in medicine are multifactorial and flap loss is similar. A less than ideal anastomosis in an ideal situation may stay patent as an excellent anastomosis in a compromised patient. But a suboptimal anastomosis will definitely clot when faced with a drop in blood pressure or application of a pressor. 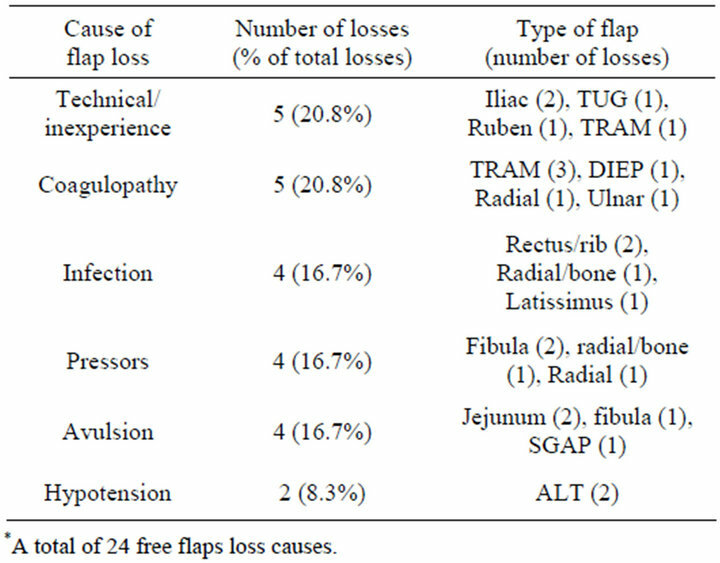 The purpose of this study is to review the factors that have contributed to flap loss on a single surgeon’s series. We then define them as intrinsic to the patient or extrinsic. We identify and categorize loss into groups. These will be used to identify potential ways to avoid flap loss. A retrospective study was performed over eleven years in a single surgeon’s practice. This practice was a high volume micropractice with 50 cases a year as defined by Chung-Su Lin . 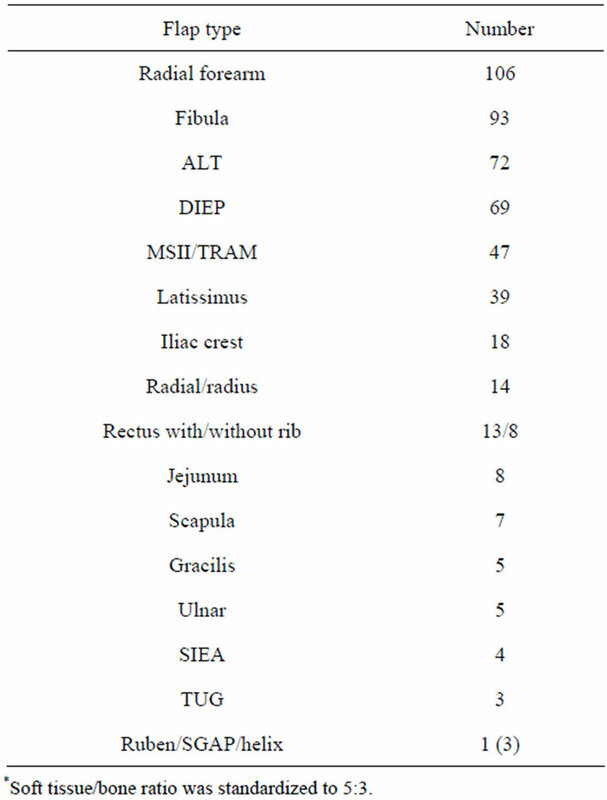 The majority of the microsurgery was for head and neck reconstruction but included breast reconstruction with DIEP, free TRAM, latissimus, and perforator flaps as shown in Table 1. All charts were independently reviewed for complications defined as minor medical management or major (surgical intervention). Partial or complete flap loss was recorded. In patients who sustained total flap loss, a thorough review was conducted of patient comorbidities, anesthesia records, perioperative and long term clinic records. The losses were categorized based on cause specifically 1) Surgical avulsion; 2) Coagulation disorders; 3) Drug (pressor) complication; 4) Infection; 5) Hypotension; 6) Technical or unknown. These were then further categorized as occurring during anastomosis versus postanastomosis. Table 1. Overall flap summary by region. were sown with 8-0 or 9-0 interrupted nylon and veins were coupled with a coupling device. At least one vein, usually two, was connected with the largest possible coupler (3 mm average) . Monitoring was by visual assessment or hand held Doppler. Pre-flap harvest protocols included 3000 - 5000 units of IV heparin bolus and post-op low molecular weight heparin subcutaneously administered. Compromised flaps were placed on a heparin drip or dextran was used in less than 5% of cases. Urokinase was attempted up to 8× to salvage flaps as well as leach therapy for cases of venous congestion. Tissue oximetry monitoring was available for the last 50 cases (Vioptix) . A total of 514 flaps were reviewed with the flap site shown below in Table 1. It should be noted that 50% of the head and neck flaps were for tumor recurrences, 2nd flap, or post radiation failures. The flap types used and the number are shown in Table 2. 15% or 76 out of the 514 flaps returned to the OR for complications or to try to salvage the flap. The causes for return to the OR are listed below in Table 3. Table 2. Anatomical donor sites. predominately fat necrosis in breast and the skin in osteocutaneous flaps for head and neck. The anastomic or vascular exploration rate was 7%. The following flaps were lost with the cause of their loss shown in Table 4: 4 TRAM/DIEP, 3 fibula, 2 ALT, 2 radial +/− bone, 2 rectus/rib, 2 iliac, 1 jejunum, 1 SGAP, 1 ulnar, 1 TUG, and 1 Ruben. The most common cause of failure was technical/inexperience in five flaps (Figure 1). Five flaps were in patients who were later found to have coagulation disorders (homozygous mutations of MTHFR gene and factor V Leiden)  (Figures 2 and 3). Two of the partial loss cases also demonstrated coagulopathies. Four patients were exposed to multiple doses of neosynephrine and subsequently lost their free flaps (Figure 4). Two partial losses were attributed to neosynephrine. Three doses were given during the primary therapy and three during reexploration. Three other cases had salvage thromboembolectomies to save neosynephrine induced thrombus. Three doses were given to older patients with evidence of atheroma, but no obvious vasospasm. The affected patients were relatively young (38 yo fibula, 30 yo radial forearm, 53 yo radial forearm, 63 yo fibula). Table 3. Summary of major complications. Table 4. Summary of flap failure etiology. Figure 1. A 40-year-old male’s symphysized defect is reconstructed with DICA flap. Dental implants prolonged the case but the flap was eventually lost due to technical failure. Figure 2. A 43-year-old woman with previous wide resection of the check and orbital exoneration for a lacrimal gland tumor. Reconstruction with a SIEA flap was attempted but clotted intraoperatively followed by a DIEP flap at the same setting to different vessels which also thrombosed. The patient was later found to have multiple homozygous clotting disorders. Figure 3. A 31-year-old female with previously resected oral squamous cell carcinoma. The patient was reconstructed with a radial forearm which returned to the OR for a thromboembolectomy. Three years later, a recurrence was reconstructed with another radial forearm. Intraoperative neosynephrine precipitated thrombosis and flap was unable to be salvaged. A hemolytic workup found her to have multiple homozygous coagulopathies. Figure 4. A 30-year-old male with a partial mandibulectomy defect was successfully reconstructed with an osteocutaneous radial forearm free flap. At a return to the OR for a neck hematoma, two different doses of neosynephrine were given for anesthesia induced hypotension. The flap failed from small vessel thrombosis two days later. too overly simplified. The evidence for this is provided by recent papers by Serletti [27-28]. A high-volume experienced surgeon with an enviably low 0.29% rate of failure in performing DIEP or free TRAM flaps has a 10x fold increase in failure to 2.9% when doing SIEA flaps . This illustrates that the inherent survivability of some flaps may be beyond simply the same technical anastomosis. The different success rate observed for flaps derived from the same tissue is simply the vessel involved. We have found that flaps based on the DCIA/Iliac crest or Rubens flaps have a higher failure rate as a percentage. The originator of these flaps found a failure rate of 8% [18,30]. The vessels are small, tortuous, and variable which likely contributes to this rate like that seen in Figure 1. Dissection is made more difficult by the course of the lateral femoral cutaneous nerve. Certain centers that perform a high volume of these reconstructions like MD Anderson, Sloan Kettering, and Chang Gung develop a culture of microsurgery. A culture of success is reflected in their failure rates which are historically low [8-12,17,28,31]. It’s important to mention that when a variety of flaps or new flaps are used the success rate goes down with a thrombotic rate of 17.4%, even at centers of excellence . What is difficult is to extrapolate these rates to institutions where this culture does not exist. The benefit of a team, not just the surgeon, experience and cohesiveness cannot be discounted. Familiarity with the microscope, availability of supplies, irrigation and monitoring are key. The impact of a microsurgical team and culture cannot be underscored because no matter what institution you compare to the centers of excellence one will be hard pressed to find the exact same success rates . Overall a success rate of 96% seems to be the watermark for a program to accept [8-12,21,30]. Factors like OR availability, the start time of the reconstruction, and involvement of the resident versus fellow probably also contribute [23,26,32,33]. This series also includes all patients planned for a free flap, exceptions were not made for OR table failures converted to other treatment. We have attempted to avoid the trend in for nomenclature to disguise true causes of flap failure and potentially inflate results, which may falsely improve a series. For this reason, fat necrosis in a DIEP or MSII flap is classified as a partial flap loss. This study found five glaring groups of identifiable failure. These were surgical avulsion of the flap, intraoperative neosynephrine, infection, inexperience/technical, and clotting coagulopathies. The first set of failures, avulsion injury, are technical in nature. One SGAP failed when the venous outflow was disrupted by suction after anastomosis. Extirpative surgeons working simultaneously avulsed three other flaps. 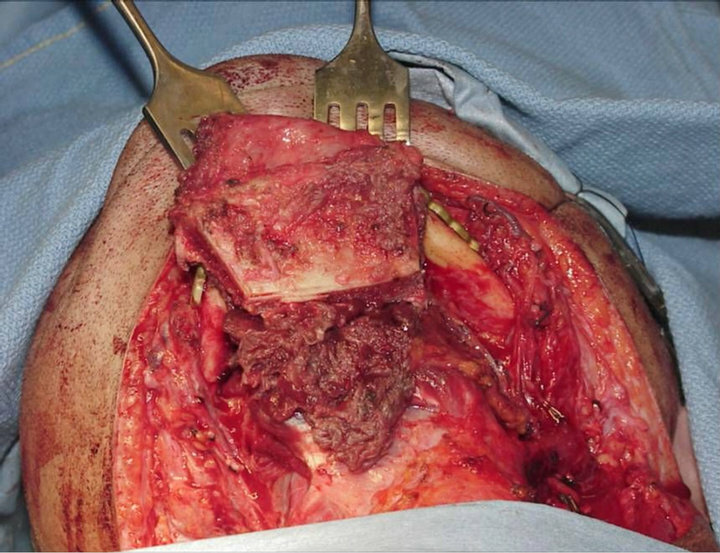 Two anastomosed jejunums were avulsed by the thoracic surgeon who insisted on insetting. A free fibula was displaced during excision of positive intraoral cancer margins. These cases illustrate the vigilance that is required to guard the flaps from one’s own team as well as others prior to secure flap inset. The large number of failures attributed to intraoperative neosynephrine is disturbing. A theory of intraoperative sensitivity to pressors after flap harvest is a “broken arrow” theory. Normally pressors with a short half life of 2 - 5 minutes would cause constriction, then neurologic feedback subsequent to ischemia would relax the vessel . However, after the harvest there is no neurologic feedback. The flap vessels constrict and stay constricted. Interestingly, in this series younger patients are more susceptible to this. Average age of failure from this was 46 years old. Their vessels are more compliant and have more active spasm as opposed to old sclerotic vessels that may not constrict. Stopping intraoperative administration of neosynephrine should seem like a simple educational problem. In a teaching environment like our institution with an anesthesia residency and CRNA program it is not that simple, the problem is compounded. A long head and neck reconstructive case with extirpation and reconstruction may take upwards of 12 hours. This covers three shifts of anesthesia attendings, which in turn supervise a revolving door of students with intervening shift breaks creating combinations upwards of 27 different anesthesia providers for a single case. Communicating to one’s anesthesia team “no pressors” at the beginning of a case may be lost in translation when the message is later passed along. A prominent sign hung over the ether curtain has been far more consistent. Hence, the benefit of a culture of microsurgery [35,36]. Figure 5. A 53-year-old male with an infected basaloid squamous cell carcinoma of the ear canal was reconstructed with a latissimus flap. On POD #8, an overwhelming pseudomonal infection contributed to flap loss. reconstruction of frankly dirty tumors, particularly fungating masses such as large squamous cell carcinomas, frequent dressing changes, and coverage for gram negative rods are essential. The ear canal and sinus are areas of special concern, should be covered appropriately, and persistent antibiotic-refractive infections benefit from early Infectious Disease consultation. Purely technical flap losses or inexperience was identified in five cases. On review it was clear that technical complications occurred in the primary attempt or secondary cases with unfamiliar flaps. A Ruben flap, a SGAP, a TUG, and ulnar flap were all lost early. Technically difficult flaps were iliac crest or radial artery with bone. This is keeping with the literature where success goes up in the later part of series . Greater anatomical flap dissection or surgical mentorship can help reduce this source of error. This also argues for a standardization of flaps, something that is not reflected in our series but has only briefly been talked about by other plastic surgeons [35,36]. The influence of clotting disorders is coming to light [33,38-40]. A recent paper on reoperative free flaps after initial failure of the flap secondary to clotting disorders was published . We have independently published our series of hypercoagulable patients with a complication of 5 total flap losses, two partial losses, and one additional thrombectomy, DVT, and distal limb ischemia . Our conclusions on the risk of hypercoagulability were underscored by Dr. Serletti who reported his own series in response . The recent interest in hypercoagulable patients highlights factors that are not routinely known for free flap loss, but are becoming more important yet still largely unidentified. As 7% of the white population has a heterozygous clotting disorder, most commonly Factor V Leiden, it may be a contributory factor. But with an ideal anastomosis, blood pressure, and donor vessel inflow it may not reach the threshold for clotting. Coagulopathy and hematologic disorders up until this point have been cited as factors in free flap outcomes but have been regarded as complex, difficult to assess preoperatively, and of variable significance. However, with the multifactorial theory of failure, any problem with clotting almost certainly precipitates a failure. As free flap surgery exits its latest era of anatomy into an era of transplantation, we need to revisit the causes of flap failure yet again. It no longer seems appropriate to attribute flap failure to solely technical inadequacy or inexperience. As with most of medicine, it is multifactorial. We hope that by raising awareness of culture, medications, infection, and hypercoagulability we will continue to raise the level of free flap salvage and success. 5) A hospital culture of microsurgery with clear and clinically defined pathways for patients is protective. R. M. Zuker, I. B. Rosen, J. 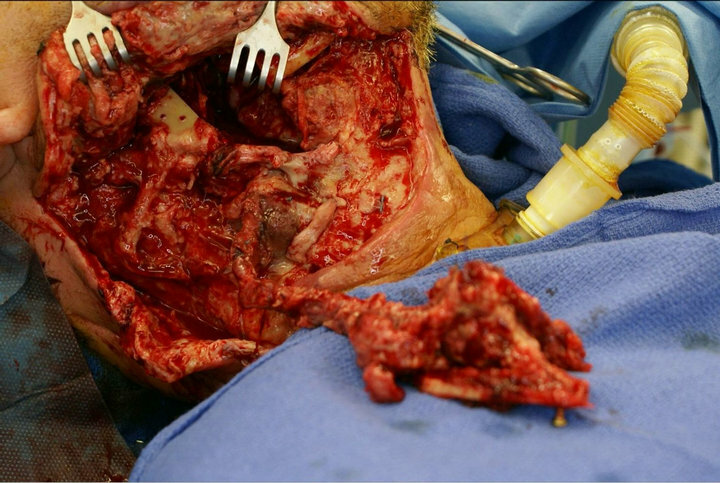 A. Palmer, F. R. Sutton, N. H. McKee and R. T. Manktelow, “Microvascular Free Flaps in Head and Neck Reconstruction,” Canadian Journal of Plastic Surgery, Vol. 23, No. 2, 1980, pp. 157-162. M. Godina, “Preferential Use of End-to-Side Arterial Anastomoses in Free Flap Transfers,” Plastic and Reconstructive Surgery, Vol. 64, 1979, pp. 673-682. I. Fogdestam, “Experiences with Free Flap Surgery,” Annales Chirurgiae et Gynaecologiae, Vol. 71, 1982, pp. 38-43. R. K. Khouri, “Avoiding Free Flap Failure,” Clinics in Plastic Surgery, Vol. 19, No. 4, 1992, pp. 773-781. R. K. Khouri, B. C. Cooley, A. R. Kunselman, et al., “A Prospective Study of Microvascular Free-Flap Surgery and Outcome,” Plastic and Reconstructive Surgery, Vol. 102, No. 3, 1998, pp. 711-721. 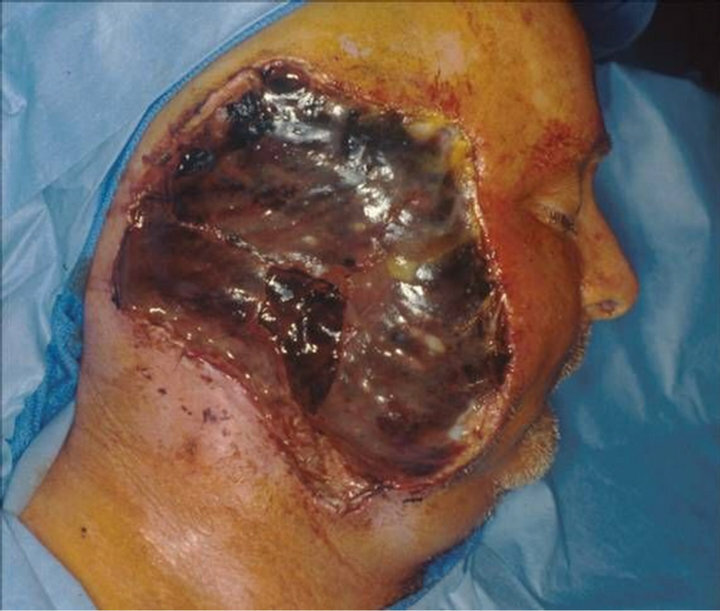 M. A. Schusterman, M. J. Miller, G. P. Reece, S. S. Kroll, M. Marchi and H. Goepfert, “A Single Center’s Experience with 308 Free Flaps for Repair of Head and Neck Cancer Defects,” Plastic and Reconstructive Surgery, Vol. 93, No. 3, 1994, pp. 472-478.